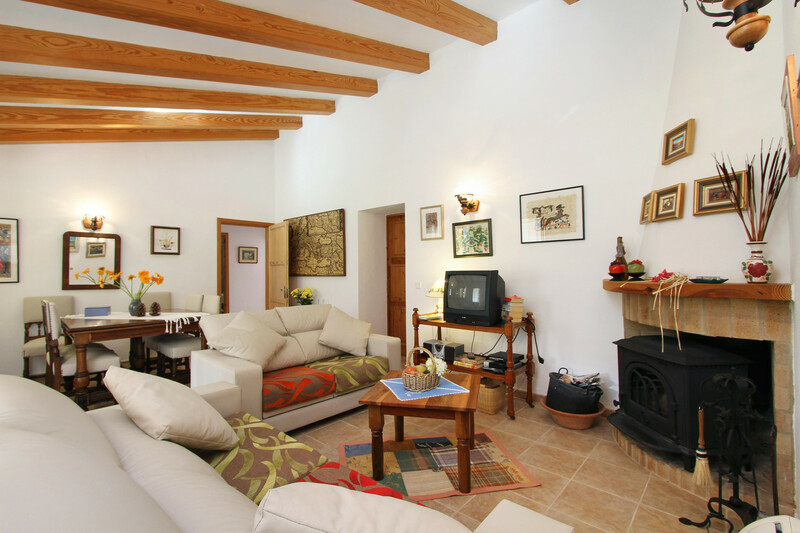 This charming, rustic villa named 'Can Pau', is built with a traditional Mallorquian stone facade and is situated in a magnificently quiet, rural setting in the North of Mallorca. 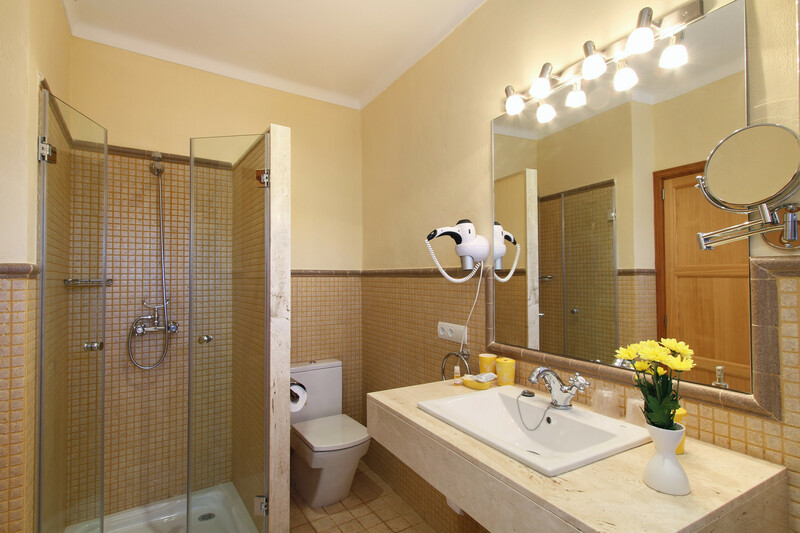 This location offers you a “relaxation feeling” right from the start of your holiday until the end. 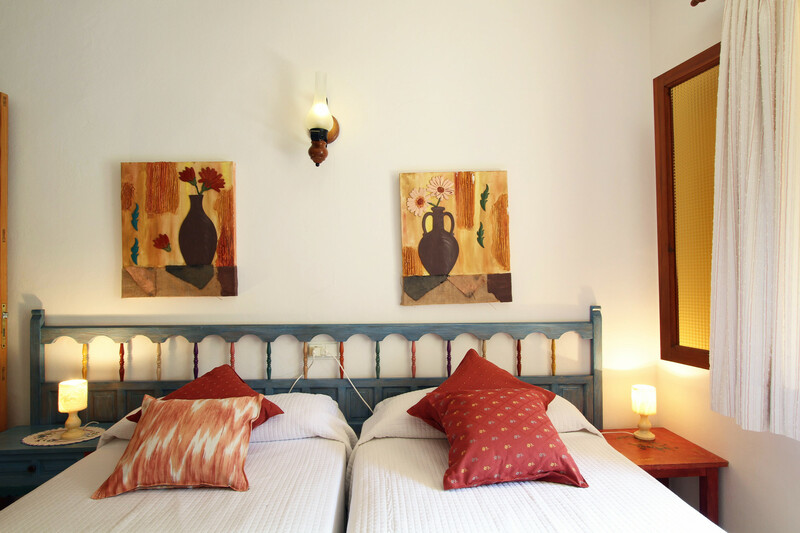 The Villa itself is surrounded by a well looked after garden full of impressive flowering plants and lined with high palm trees, cacao trees, and other venerable trees. The grass lawns provide great areas with plenty of room for our smaller guests to run riot while parents and family members can relax in the sun. 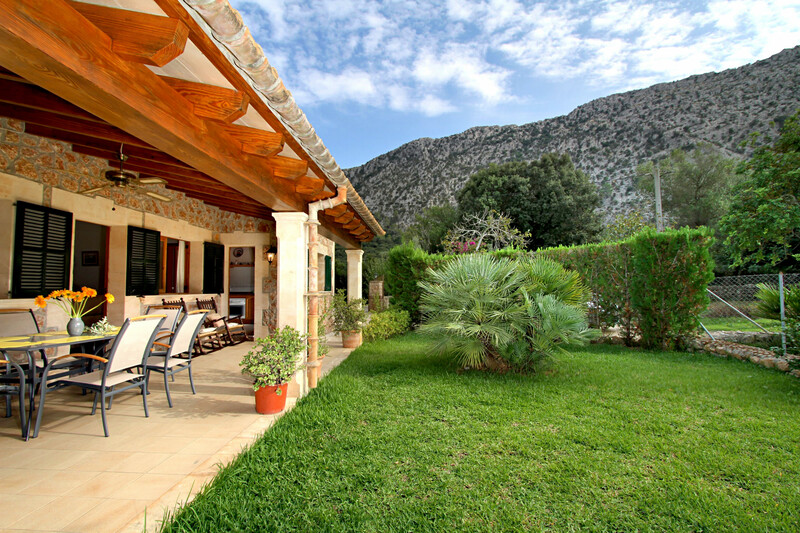 The private swimming pool and great sun terrace is directly next to the house. The pool with a convenient entry of roman steps and varying depth makes it a great area to enjoy a quick dip or long swim to cool yourself down in the summer days. This area is also fenced in to provide a level of safety for young children who are learning to walk. There is a outdoor bathrooms no need to go into the villa for a quick toilet break. After a enjoying swim in the pool you can use the outdoor shower to refresh your body before entering the sun tan feeling on the sun loungers that are found on the terrace. The house itself has a romantic covered terrace with rocking chairs and a separate area fitted out with a modern dining area. There is also a Stone BBQ area outside where all the family can enjoy a relaxed and fun family meal in the warm summer nights. 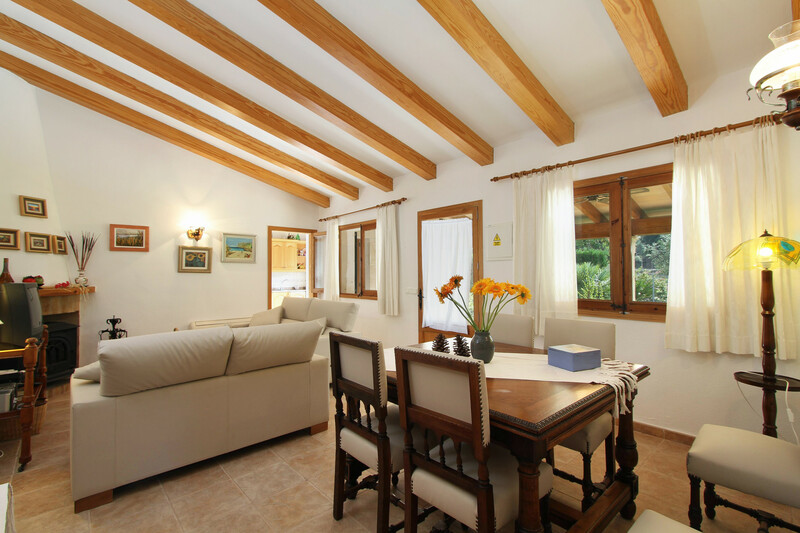 The interior of this villa provides a peaceful holiday home, with its authentic Mallorcan holiday home charm and fits a total of 6 people. The living room/ dining room is open and provides maximum comfort, especially if you would like to spend an evening watching TV in the comfortable living area. 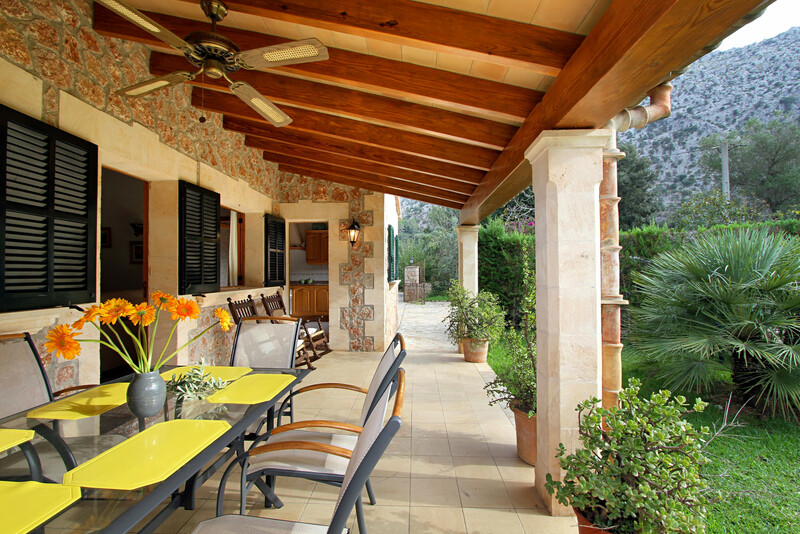 The kitchen is separate from the living area, and has direct access to the outdoor covered terrace area. With all the dining areas in and out you will not be spoiled for choice for family meals while spending time in this property. 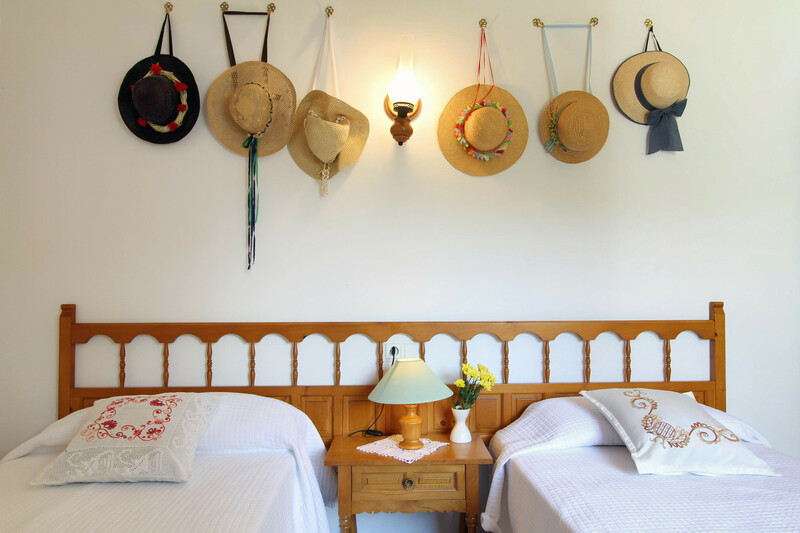 The fully equipped country kitchen provides the convenience you need for a self-catered holiday. 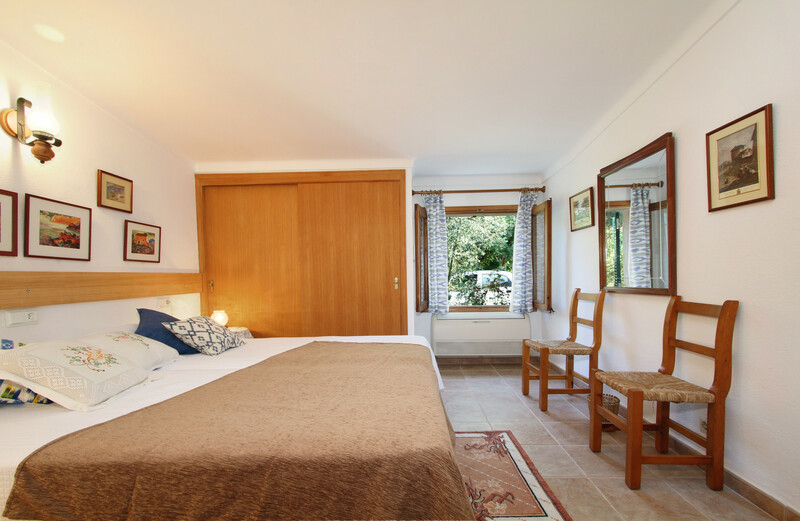 The bedrooms have double beds (two) or two single beds, so ideal for families of all ages. A cot and high chair are also available, which once again underscores the family-friendliness of this appealing property. 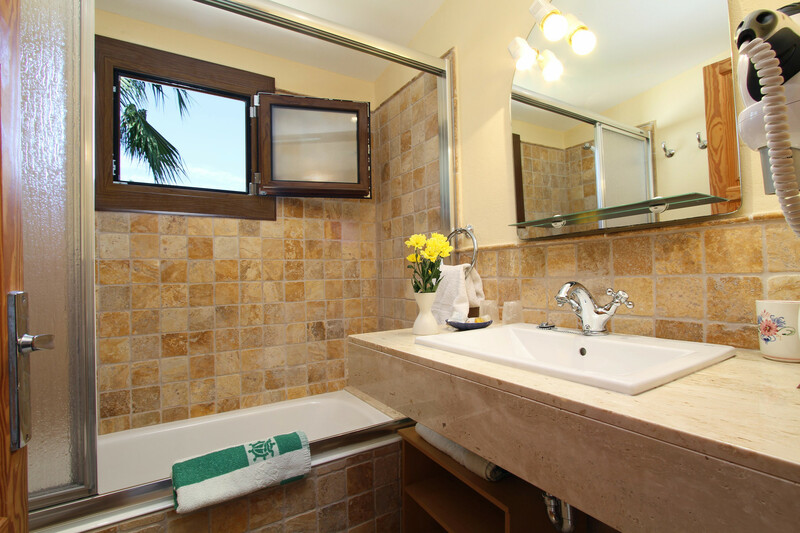 Not counting the outdoor bathroom with shower, there are another two full bathrooms in the villa each boast a bathtub and separate shower. 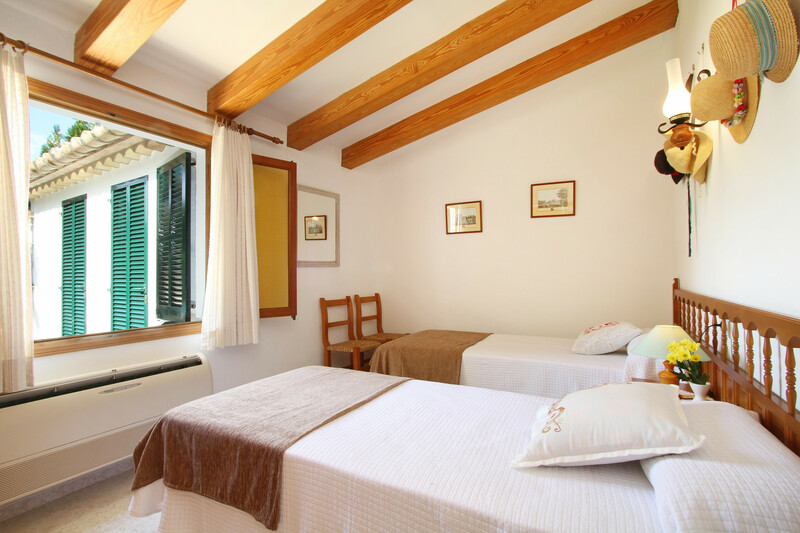 Because the subtly decorated house has a heating system, and the bedrooms all have air-conditioning, the house can be used all year round. 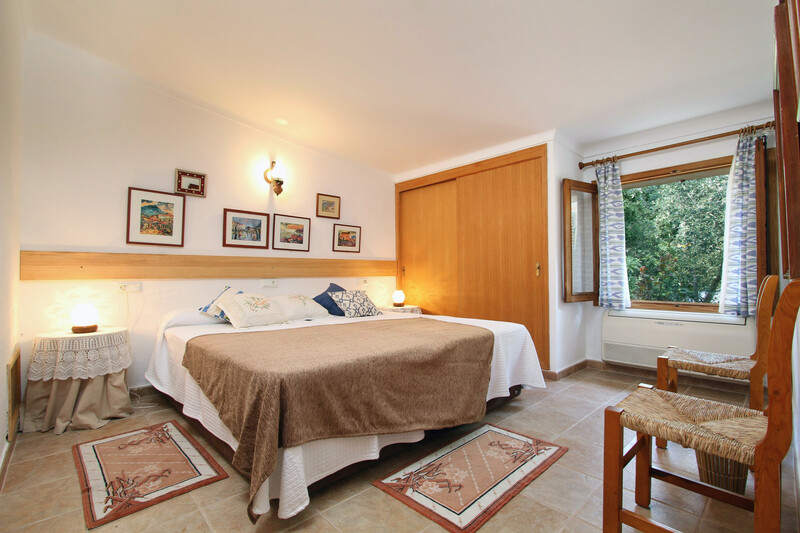 So why not relax and unwind here for a few days during the cooler season, during the still mild Balearic winter? 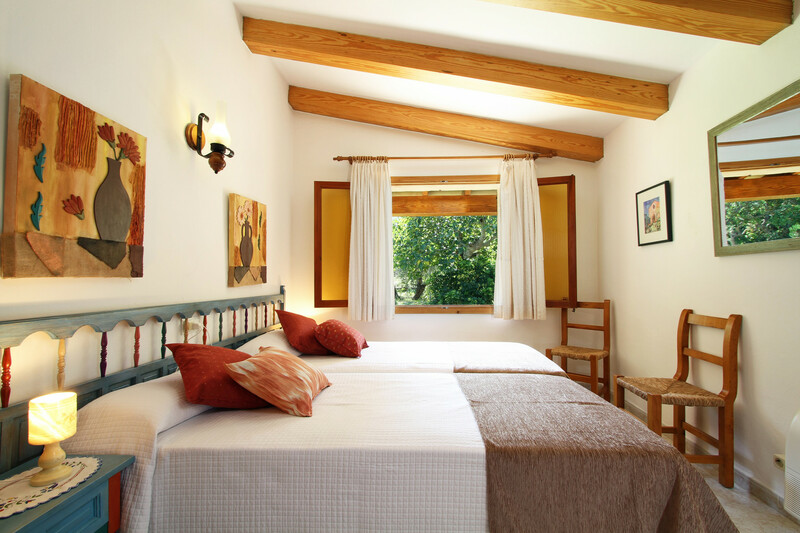 The cosy house and beautiful gardens along with the impressive region, invite you to do just that at anytime of the year with family or a quick get away with friends. 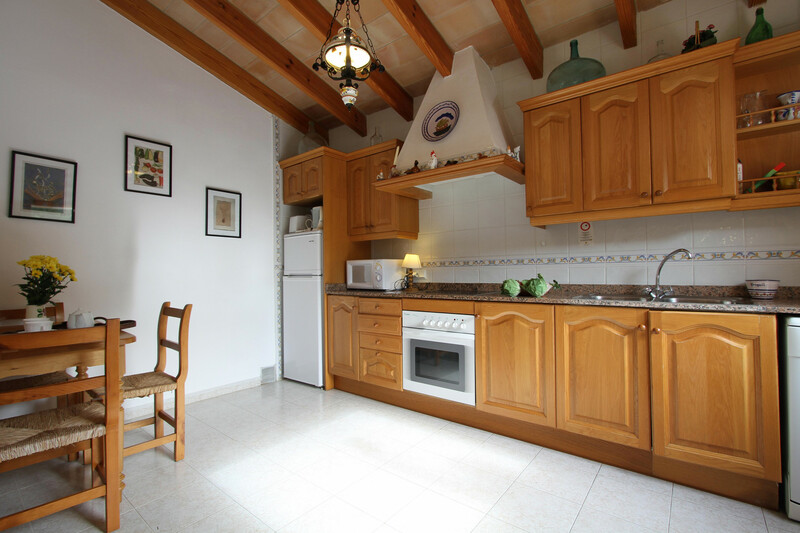 Good property for all ages and close to everything needed shops, restaurants and bars all within a shot drive from the villa but still offers you the relaxation, tranquility and great holiday feeling.